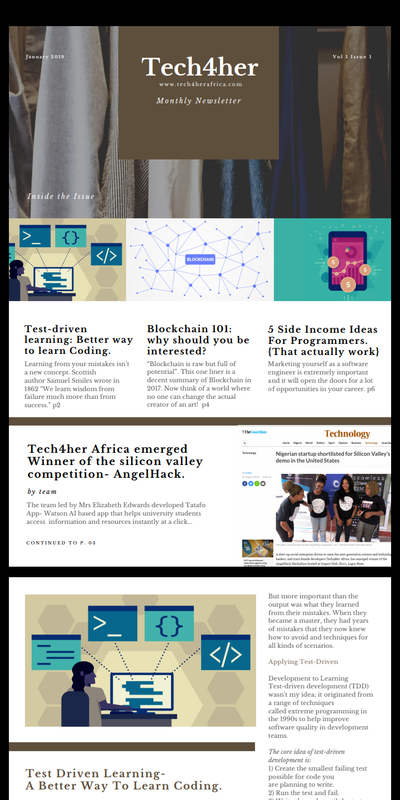 Tech4Her > Download Our Newsletters! Great news Ladies! Here is our official newsletter release for January 2019. - Why you should learn blockchain? How to get started. - Test-driven learning: Better way to learn coding. - How to turn coding skill into a money making venture. - Guess who's our #CodeSlayer for the month?! - Quiz section with prizes to be won..valid till Feb28. Feel free to share with your circles 💯 Powered by Tech4her Africa.